Digital Forsyth | Log house built by Christian Smith in 1780, on the Joseph Leinbach land. 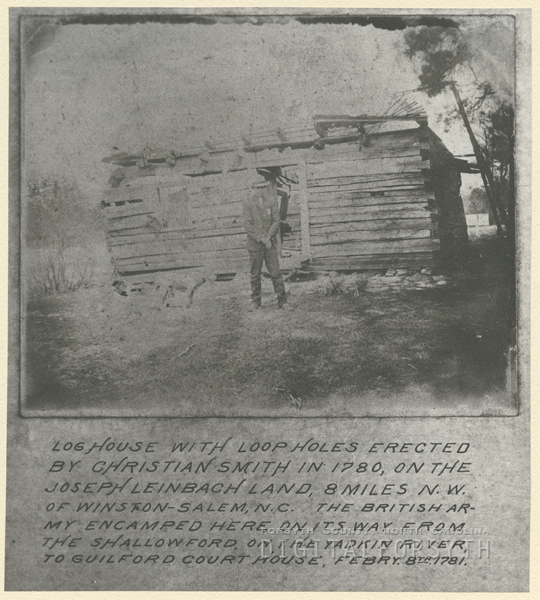 Home › Photos › Log house built by Christian Smith in 1780, on the Joseph Leinbach land. Log house built by Christian Smith in 1780, on the Joseph Leinbach land. Log house built by Christian Smith in 1780, on the Joseph Leinbach land, 8 miles N. W. of Winston-Salem. The British army encamped here on its way from the Shallowford, on the Yadkin River, to Guilford Courthouse, Feb. 8, 1781. Is it known where and when Christian Smith was born. I have an ancestor by same name born in Adair, KY.
Hey Kenneth, this Christian Smith was originally named Christian Schmidt and moved to NC from Prussia with the Moravian church. His son was named Christian Smith and he moved to Adair KY. I have traced the family tree all the way from there to my grandfather, Jonnie Smith.